David Arms, a well known and respected artist who hails from Nashville, set out to capture the story of Scripture and God’s grace on canvass. The result which he calls “God’s Story” is a large painting that stretches across the chancel of a large church in Franklin Tennessee. 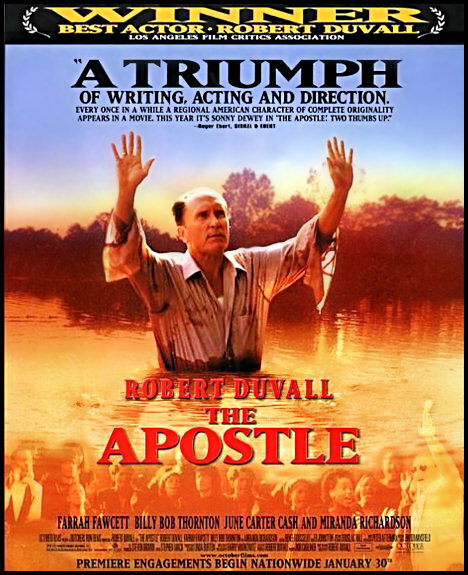 It is a masterful portrayal of God’s redemptive work. Each panel of the painting powerfully shows us the four connecting parts of God’s gracious plan of redemption for His creation. In the first panel we see Creation. Here we have life with clear blue skies, beautiful birds who are no doubt singing, a strong vibrantly alive oak, and a bright red apple representing God’s gracious provision. The second panel, representing the Fall and sin, stands in stark contrast to the first. Its somber and dark hues leave no doubt that an unthinkable loss has occurred. Clouds are in the sky. Black crows, symbolizing the death that has come, are perched upon a leafless and lifeless tree which sits lower than any of the trees in the other three panels. In fact, the entire panel seems to sit lower as if the entire frame and what it represents has fallen. In the third panel Redemption has come. God has come to make all things new. Here we see the agent of redemption, Christ, symbolized by a cross which sits in the center of a restored oak tree. Though the sky is not as clear and blue as in the first frame, it is obviously clearing. Flying around this “tree of love” are three butterflies who proclaim, through their simple beauty, the new life that has been won through Christ victory over death. Above the tree is an egg, which might at first seem an odd and out of place symbol; however, the egg perfectly communicates what has occurred here and is still occurring. The egg tells us that life in Christ is here but that a much greater and fuller life is on the horizon because of Christ sacrifice and victory. In “A Good Man is Hard to Find” a grandmother and her son’s family are ruthlessly killed by an escaped convict while on vacation. Many struggle with the violent plot because the family and grandmother seem so innocent. This gruesome scene does not, however, serve as senseless violence. Beyond the disturbing imagery is a story that makes poignant Christian claims. The grotesque scenes allow readers “to peer into the souls of the character.” As O’Connor herself said, “Distortion in this case is an instrument; exaggeration has a purpose, and the whole structure of the story or novel has been made what it is because of belief. This is not the kind of distortion that destroys; it is the kind that reveals, or should reveal.” What it reveals is the total depravity of the human heart and soul apart from God. What it reveals is the destruction sin brings and the need for an unfathomable grace. In “A Good Man is Hard to Find” the moment of grace occurs as the grandmother reaches out toward the convict, calls him one of her children, and then is shot three times. The grandmother realizes that nothing is going to stop the convict but reaches out anyway. Unfortunately, the killer is so in love with his falleness that he rejects her love and embraces death. In this moment, O’Connor highlights the sad reality of so many who hear the grace of Christ but refuse to surrender that which enslaves them. O’Connor wrote that “grace changes us, and change is painful.” In “A Good Man”, the grandmother suddenly sees the convict as a creature Jesus loves. If you read her stories carefully you see see beauty where you otherwise wouldn’t. You will be encouraged to engage the culture in which you live without surrendering your faith, to honestly address the evil we encounter living in a fallen world, you see the grace of God in the brokenness. “Now we see but a poor reflection as in a mirror; then we shall see face to face. Now I know in part; then I shall know fully, even as I am fully known” (1 Corinthians 13:12). So to answer our question: Can grace be found in violence and the grotesque? O’Connor believed it could. However, if you do not believe her, look to Genesis and Noah or look to Joshua and the Israelites. But, perhaps the best place to look is into the face of God as He hung on a cross so that you could become one of His children. Giovanni Antonio Bazzi’s high renaissance painting “Procession to Calvary” was created over 500 years before Mel Gibson’s film “The Passion”; however, each are masterpieces in their abilities to capture the torment of Christ. Bazzi, also known as II Sodoma, masterfully reflects the majesty, although willingly lowered, of Christ here. He is a strong and muscular figure with the light of glory reflected throughout His being. Here is God. He is bowed but is there any doubt that it is by His choice? We are in the painting as well. Bazzi portrays our ability to be both kind and cruel but in both sinful. On one side of the painting are those with clinched fists, angry expressions, and aggressive stances. On the opposite side there are those with open palms and saddened faces, but they do nothing. 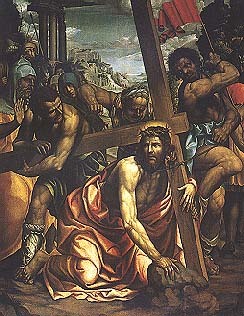 We do see Simon from Cyrene appearing to grasp the cross as he begins to take it for our Lord. But we know that even he did not do so willingly. No one was without fault. No matter if their sin was intentional of passive, it was all sin and how horrible sin must be to have brought God’s Son here and place that look of agony upon his face. The process of separation has begun and it is this truth which Bazzi captures so clearly. This strong muscular figure, this one with the glow of glory so clearly communicating His divinity has the face of agony. The agony we see here is not from nails, nor blood, nor humiliation. The agony is from the separation which has begun. John Calvin tells us that Christ “paid a greater and more excellent price in suffering in His soul the more terrible torments of a condemned and forsaken man.” In the face of the Son of God we see a soul experiencing a pain we can never fathom. God came. God kneeled Himself willingly. God allowed Himself to experience the pain we see here in this tormented face and it was all just beginning. The agony you see is the look of grace in the face of our Lord and there is nothing cheap about it. How He must love us. Peter Paul Rubens’ classic painting “The Last Supper” is beautifully striking in its contrast and symbolism. In that contrast you can see grace if you look for it. The figure of Christ is centered, prominent, large, with a heavenly light outlining His head. There can be no doubt that Rubens’ intention is to boldly proclaim the deity and majesty of Christ. Here is God. Here is God surrounded by men. Here is God fulfilling His mission. Here is God knowing what is to come. Here is God sitting with those He loved, those He came to redeem, restore, renew, forgive. Rubens is telling us to remember. It is all here in this beautiful portrayal: majesty and falleness, deity and humanity, holiness and sin, redemption and decay, grace and judgement, mercy and betrayal, forgiveness and bitterness, love and envy, sacrifice and selfishness. It is all here in the image of God and man. Remember. Can you see His grace here? It is written on His face as He looks to His Father and it is written upon the face of the one who looks at you. Grace and sin are both sitting at that table. However, although sin sat at the table with Him and even looks toward you, it will never be strong enough to overshadow God’s grace which sat there as well. Remember! The remainder of his life Cash would point to that jail cell as the place where he accepted his inability to control his behavior and began to understand the gracious nature of God. Before coming to Lafayette, Cash constantly switched his trust from drugs to his own inner strength. However, sitting in a jail cell created by his own sin, he was reminded to trust in God’s grace working through him. Two days after his release Cash walked down the isle of a church in Hendersonville, Tennessee and dedicated his life to Christ. Can I tell you something which has always bothered me and I have never quite understood? A lot of Christians I grew up around didn’t like Johnny Cash; in fact, a good many insisted that he was never a Christian at all. He spoke, wrote, and sang about salvation found in Christ for almost forty years. One of his closest friends was Billy Graham the most famous preacher of his lifetime. But still, he drove many fellow believers crazy. Why? Well, although Cash was a Christian he was never religious. While he and Billy Graham were indeed close, he had other friends also; friends such as Willie Nelson, Bob Dylan, Tom Petty, and Kris Kristofferson. Although he sang about Christ, he also sang about sin, pain, and loneliness. Cash ‘got’ grace and, to be perfectly honest, grace can drive the religious crazy sometimes. For this reason, I believe, allot of ‘Christians’ didn’t like Cash very much. His authenticity and honesty made the religious look, for lack of a better word, hypocritical, and religious hypocrites tend to not like it when they are revealed for who they really are. On the cover of one of his last recordings Johnny Cash stands with one dog at his right and another at his left. One is black with a white stripe and the other is white with a black stripe. Cash named them after the two dynamic forces of each of our lives: Sin and Redemption. He told Rolling Stone, “When I was really bad, I was not all bad. When I was trying to be good, I could never be all good. There would be a black stripe going through.” Sounds a lot like Romans chapter seven to me. Sounds like a man who ‘got’ grace, a man who understood that each of us are sinners saved only because of the gracious gift of a merciful God. I wish more of us understood the gospel as well as this frail, fallen, sinful man did. Johnny Cash ‘got’ grace, have you? *Resources used for this post were: The Man Called Cashby Steve Turner. “Johnny Cash Clouded by Pain, Colored by Grace.” by Denis Haack in By Faith July/August, 2005. “Cash Talks Love, God and Murder” Rolling Stone, June 30, 2000. For more about Johnny Cash you can go to my “Great Lives” page.